The new Museum of Bavarian history is a didactic sculpture in urban space narrating the past and future, rooted in the traditions of the preceding and coming generations. Two separate volumes (museum and administration) bring a deliberate tension within the historical context of the city. Through undertones and metaphors the building makes historical references to the historical city for e.g. the stone cladding that corresponds to that of the Regensburg cathedral. The building does not have a clearly defined and easy readable form. This is as a direct response of the diversity in content being exhibited. History is too alive and cannot therefore be placed inside a box. To emphasize the form of the museum volume the administration facilities were handled in a more reserved manner. The museum is entrance is from the Danube facing side which is situated underneath one of the large cantilevers. At the southeast corner a restaurant and amphitheater can be accessed freely and irrespective of museum opening hours. On the inside a central rotunda, with its grand staircase and skylight, allows the visitor to metaphorically meander through history along the staircase to eventually break through the tree canopies of the Bavarian forests to reach the ‘Bavarian sky’. On occasion through this journey the visitor enters into pockets of space which make out the exhibition halls that tell the story of the unique Bavarian landscape and people. The special exhibitions and event spaces on the first floor are easily accessible via escalators. The exhibition spaces are open and free, but still structured by alternating room ceiling heights. Repeatedly as one moves through the museum the visitor is granted with glimpses to the Danube, the Regensburg Cathedral and panoramic city views. The proposal of a free design is adapted to emphasize the generosity of the place in which the museum is located. Among the projecting volumes of the building overhangs arise unique spatial zones and niches where visitors to Regensburg are welcomed or may gather in front the museum protected from the rain and sun. Potent building design by two architect studios from Porto, Portugal. As a competition design this is convincing – the renders certainly make it look both boldy contextual and knitting into the texture of the city. 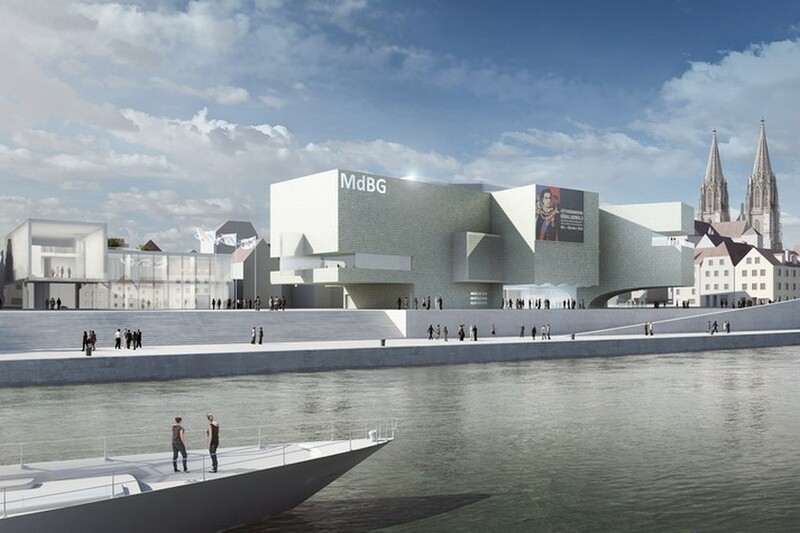 This design “explores the ability of architecture and urban planning to spread a cultural event, so that the transformation…leads to optimism and a contrasting pleasure drive between the river, the museum, the city and the public in general”.